Today's dose of must-know knowledge. | Trouble viewing? View in browser. Online Master of Science in Integrated Marketing Communications. Learn to develop and manage marketing communications for a consumer-controlled media world. Earn your master's degree in Integrated Marketing Communications completely online from the Medill School at Northwestern University. Learn more. Learn to develop and manage marketing communications for a consumer-controlled media world. Earn your master's degree in Integrated Marketing Communications completely online from the Medill School at Northwestern University. Click here to learn more. 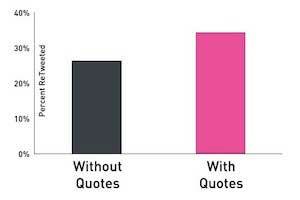 Do Tweets With Hashtags, Quotes, and Images Get More Retweets? Virtual Conference—Take your mobile strategy from zero to hero Sign up for free! We protect your privacy. All logos and names are the copyrights of the respective owners.